Living in a country that has a temperate climate, we have to be adaptable. From the food we eat to the clothes we wear, we are obliged to modify our lives to acclimatise to the seasonal changes in temperature. It is easy enough to swap out our summer pastels for deep autumnal reds and oranges, and we face no issue when moving from hearty winter stews to lighter spring salads. However, ensuring that our homes themselves work around the seasons is a complex matter that can be resolved through versatile design. When it comes to the kitchen, there is no other room more versatile. The kitchen is a space just as much for entertaining and relaxing as it is for cooking and eating. This multifunctionality is reflected in contemporary kitchen designs – vast open-plan entertainment spaces, intimate communal seating areas, ergonomic multi-purpose islands, impressive bar accessories, the very best high-tech entertainment devices, the list goes on. consideration of those capricious external elements – light and heat. In this post, we’ll explore the key design features that will ensure your kitchen is suitable for all seasons. Your kitchen should be able to bask in the glorious light of summer whilst also savouring the limited light of shorter, winter days. The best way to achieve this is to maximise the natural light coming into the room. 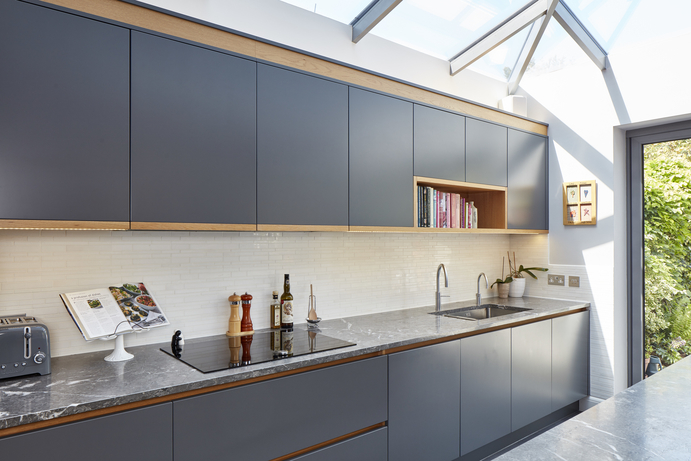 Large contemporary windows and skylights not only flood the kitchen with natural light but also ensure it feels far more lavish and spacious too. Don’t lament the changing of the seasons; observe it from the comfort of your kitchen island. 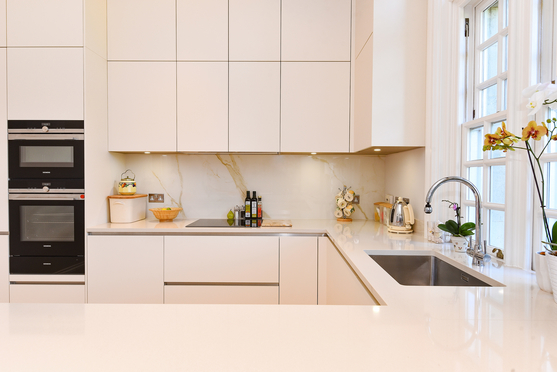 Stone tiles and worktops, light colour schemes, mirror and metal accents will reflect any available light and illuminate darker areas of your kitchen that natural light struggles to reach. This applies equally to artificial light too. Chrome ceiling down-lights work wonders in the sleeker, more modern kitchen, while copper or brass pendants will be perfect for bringing light and reflection to more industrially-minded designs. As a room that will be popular throughout the year, it will need to work in all seasons. As such, the kitchen’s colour scheme should be fresh in your mind at all times. 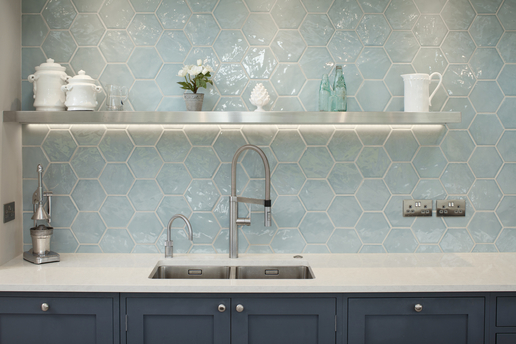 Azure blue might be fresh and airy in the summer but come winter and your kitchen may look cold and harsh. The same applies for deep, darker colours such as burgundy, which will feel comforting in autumn but may look too harsh and unforgiving in spring. The solution is to opt for more neutral tones that will naturally adjust to the seasonal light and colours that surround them. This doesn’t mean you have to settle for the ever popular and often far too average whites and creams, but that you should look towards subtler shades of your preferred colours: duck egg, sage and daffodil may be more suited to your kitchen than more abrasive shades of blue, green and yellow. These hues are versatile yet unique and will ensure your kitchen exudes sophistication throughout the year. Choosing a neutral colour palette for your kitchen also allows you to get creative with your kitchen appliances and accessories. Think matching vintage canary yellow toaster and fridge or plush mint green seat cushions on your island chairs. Supplement the surrounding neutral tones with a striking injection of colour without being oppressive. No other aspect of your kitchen is more susceptible to temperature change than your floor. Fully carpeting your kitchen is impractical for most homes but there are options available that can cope with the extremes of any season. Stone floors not only look elegant and contemporary; they are crisp underfoot and keep your kitchen cool in the warmer months. Create a seamless flow of stylish stone from your kitchen onto your patio, allowing your summer soirées to effortlessly spill from the kitchen to the garden. Conversely, when the mercury begins to fall, having underfloor heating will avoid any early morning shocks when you enter the kitchen barefoot for your first coffee of the day. The heat generated will rise to warm your kitchen and quickly spread throughout your home. Wooden floors are another arresting and versatile option, and are typically less prone to temperature fluctuations than stone. While they too can benefit from underfloor heating, the rustic aesthetic of wooden floors also lends itself to accessory. Consider vibrant, texture-rich rugs to give your kitchen a hit of vintage charm alongside extra warmth and comfort. Used effectively in well-trodden areas of the kitchen, they can act as both stylish, statement pieces as well as functional insulators. When spring comes around again, they can easily be stored away until the nights begin to draw back in. An Extreme kitchen is always designed with our customer’s needs in mind. Collaborate with our designers to craft a kitchen fit for all seasons. To discover more, visit one of our design studios today.